Nope, this isn't photographic evidence of angels. It's something even much cooler than that: an Atlas V rocket transporting an uncrewed Cygnus capsule, blasting off into space, as captured from the view of an astronaut aboard the International Space Station. 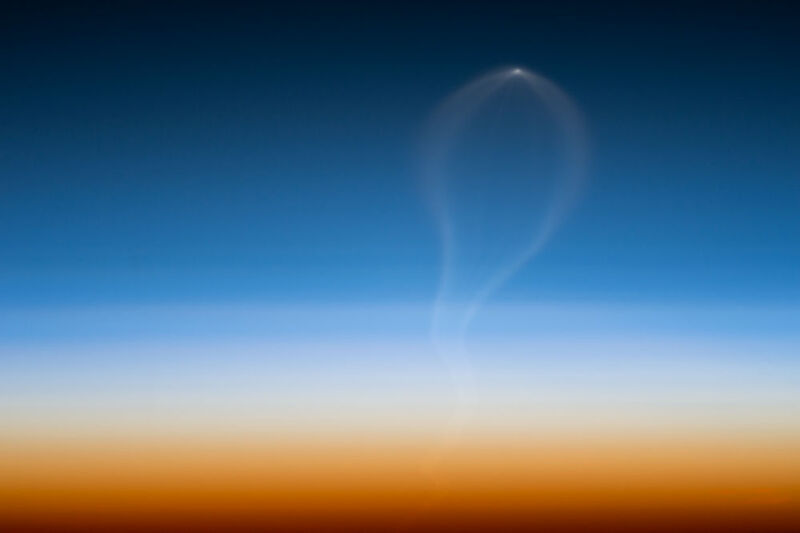 The small point at the top of the photograph is the rocket, and the white vines trailing from it are exhaust clouds from released by its engine. About two-and-half days after this photo was captured, the Cygnus docked with the ISS and delivered 7,745 pounds of cargo. But that's not the only why it's so cool. It's cool because it emphasizes us to ponder that how tiny us humans and all of our rockets are, and yet also how far we still have to go: evading the cuffs of gravity on the reg, turning large metal into cloud stuff, becoming a wisp upon the wind — even if only for a few moments at time. This spectacular shot was taken by a member of the Expedition 45 team with the help of a Nikon D4 digital camera with a 1150-millimeter lens, according to NASA. And it's certainly an incredible, remarkable shot.